Want to shop online but don't have a credit card? Need quick loans for emergency situations? Too much hassles to apply for credit or have been rejected before? Fortunately, Kredivo is here for you as an online credit line provider that offers installment without credit card as well as personal loan. Kredivo is an award-winning app (#1 Fintech Startup in SEA at the Singapore Fintech Festival 2018) that evaluates your creditworthiness in real-time. The registration process is just 1 minute and approval is given in a few hours. 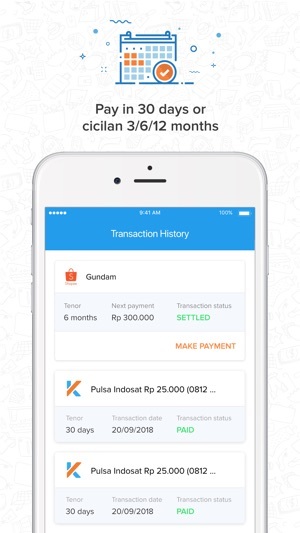 If approved, you can directly shop online on installment using Kredivo “buy now and pay later” on Tokopedia, Shopee, Lazada, Bukalapak, Tiket.com, and 200+ other merchants with just 2 clicks. Want to buy a new mobile phone? You can buy it online, no credit card needed and zero down payment, by choosing Kredivo as a payment method at your favorite merchant. You can also buy pulsa/data, pay bills, take personal loans inside the Kredivo app directly and get quick cash advance to cater your every need. Want to have a seamless online flight booking experience? You can book your flight ticket now and pay later, anywhere you wish, through Kredivo app. Right at your fingertips, you can find the cheapest flight tickets from various airlines, from both domestic and international, including Garuda Indonesia, Batik Air, Citilink, and AirAsia. Kredivo offers you two payment options: pay in 30 days with 0% interest, and three, six or 12-month installments with the lowest interest rate among other non-bank credit sources: 2.95% per month or a maximum annual rate of 41.74%. 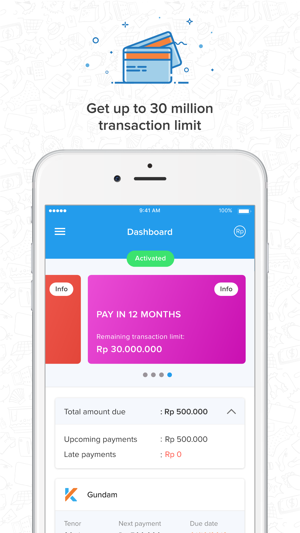 If you choose a 12-month installment to pay a transaction worth Rp 2,000,000 Kredivo charges an interest rate of 2.95% per month. The repayment amount that must be made per month is Rp 206.710 and the total payment after a year is Rp 2.480.450. You can apply for an installment and take personal loan without any credit history, because Kredivo is leveraging AI and machine learning technology for its proprietary credit decisioning system. 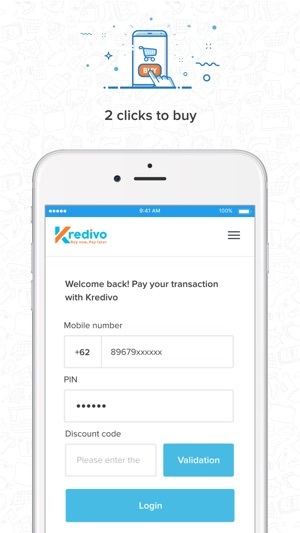 Kredivo offers accessible, and convenient credit. 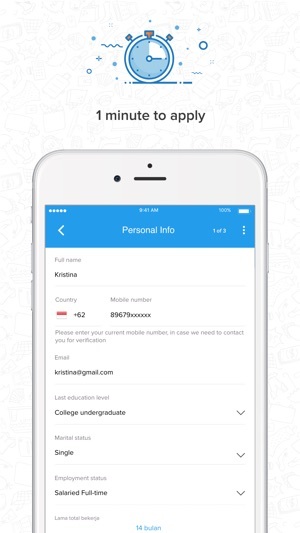 You can just apply online by connecting your digital accounts via Kredivo’s mobile or web app. After an approval process that takes minutes, you can utilize a simple 2-click checkout when shopping online, or get personal loan within 10 minutes. Don't worry about security, because all Kredivo user’s data are encrypted. Kredivo has also been officially registered and regulated by OJK, so its credibility is guaranteed! 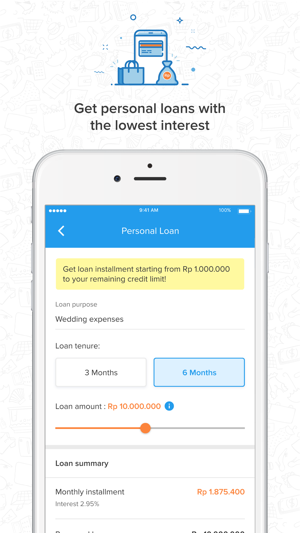 Compared to other non-bank credit sources, Kredivo offers the lowest interest rate. Plus, there is no down payment charged for all Kredivo services. Have feedback for us? Email us at support@kredivo.com. Business address: Rukan Permata Senayan E52-55, Jl. Dapet kredit limit 20juta dalam hitungan menit!